In our line of work travelling the county is just part of the day job, so I’m always pleased to discover new places and Suffolk is a county that keeps coming up trumps. There’s an idyllic oasis – a patch of Suffolk turf I’d never encountered – nestled in the Bromeswell, Ufford, Eyke triangle that is Lower Ufford. I knew it existed; seen it on a map, could even name the famed village pub – but I’d never actually visited. So with a blue sky beckoning and a hankering for some fresh air we headed to the White Lion Inn for a spot of lunch – al fresco. Approaching the White Lion through the lanes I realised why I’d never been – it’s simply not the kind of place you’re going to happen upon. Even though I’ve driven to and from now, I’d urge you to lock the co-ordinates in your sat nav before you forget because once you too have found this gem you’re going to want to return. Mind you, you won’t be the first. The village is steeped in history with first references to the inn way back in 1618 when it’s recorded as being sold for the tidy sum of £180! Its changed hands many times over the years but since acquiring the White Lion back in 2003 current owners, Stephen and Gaynor Thurlow, have strived to retain its unspoilt character. It’s one of the smallest pubs in the county and one of only a handful serving real ales straight from the cask to glass on its traditional stillage. Don’t expect to find anything remotely commercialised here; this is the absolute antithesis to the pub chain culture. Stephen opened the pub’s own micro-brewery four years ago and has more recently been joined by his son Robert in running the venture. The beers, listed in the Good Beer Guide, take their names from the ancient Saxon river crossing – Uffa’s Ford - that gives Ufford its name. Uffa Golden Hoard, Uffa Readwald’s Tipple, Uffa Longboat – they all sound so inviting; he’s even brewed a new IPA – Uffa Drenchorn – specially to accompany the new alfresco menu. There’s also Uffa Punch; named to recognise that the very first Suffolk Punch horses were bred on land adjoining the inn’s meadow and still the mothers an foals graze close by in the summer months. It’s these details, woven into the fabric of the White Lion, that resonate a genuine love and respect for the village and its past. 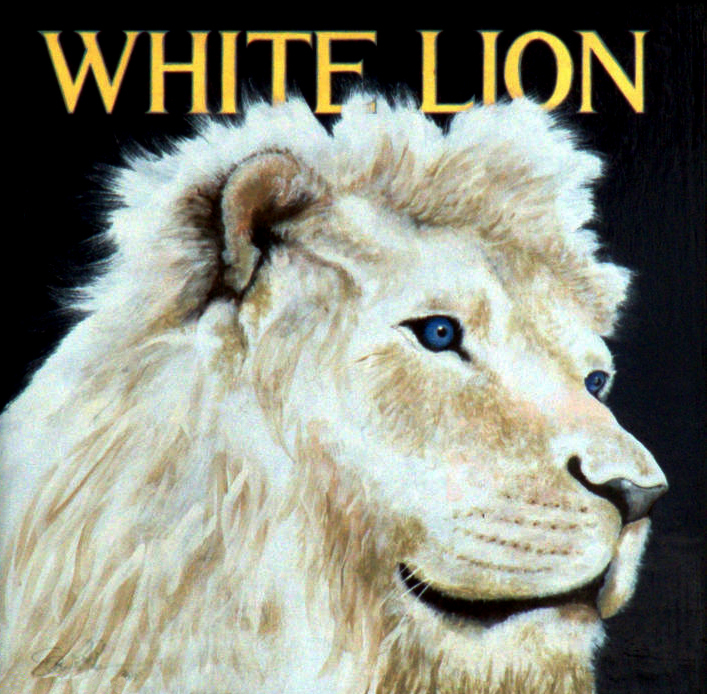 Unsurprisingly this healthy adoration has been reflected in the way in which the White Lion has become an essential part of the Lower Ufford community hosting weekly clubs for everything from table tennis to sailing, through to major events like the spring and autumn vintage car rallies, golf days, bingo nights and beer festivals. This is a team rolling up its collective sleeves and getting completely immersed in village life –duly picking up a number of Community Pub of the Year awards. But on this beautiful sunshiny day we were interested in lunch and in particular the start of a new season of al fresco offerings - successfully piloted at the end of last summer and into the autumn. Stephen’s background is first and foremost as a chef - although his talents and interests are broad to say the least – and his love of food is very clear, even just from the set up at the pub. I mentioned that it’s one of the smallest pubs in Suffolk but that’s just the cosy interior – outdoors is quite a different story. For a start the seating varies from benches suitable for four, six or eight right up to two mammoth tables for 18 to 20 diners. Alongside the herb garden and poly tunnel the outside kitchen includes a brick pizza oven, barbecue and chiller; perfect for watching the chef busying over your menu while you enjoying your cool refreshment. Some tables are covered but there’s a marquee set up as well – ideal for corporate events, weddings and parties but great too for less clement conditions. Diners at the White Lion make their selections from a chalk board where permanent stalwarts like pie of the day, beer battered fish and chips or bangers and mash are joined by a more changeable selection reflecting the best of the season from local suppliers. But the alfresco menu is a little different. 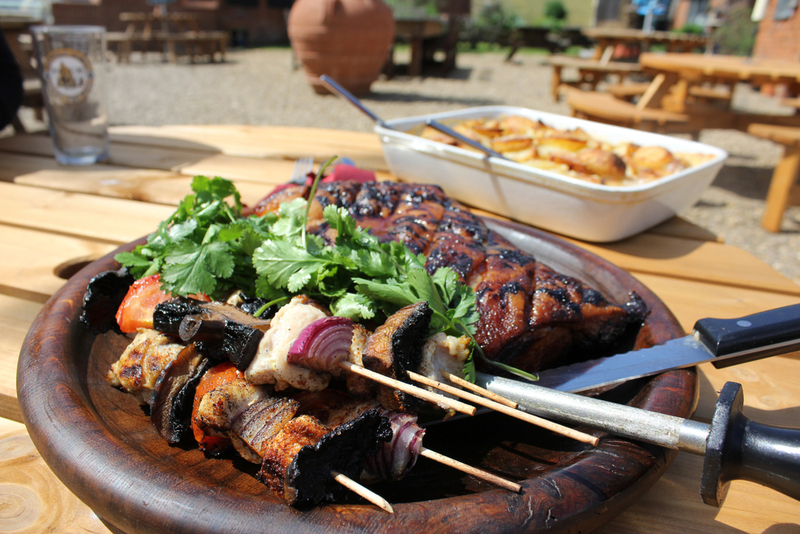 As well as the thin based hand-made pizzas and barbecued steaks there’s also an enticing choice of whole joints, cooked to pre-order on the charcoal rotisserie. For example a whole leg of lamb, studded with rosemary and garlic and ample to share between eight, or perhaps a whole free range chicken, marinated in honey and lemon thyme dressing for a party of four. We had pre-ordered the loin of pork – marinated in treacle and balsamic vinegar syrup and it was cooked to absolute perfection. Carved at the table – either by yourselves or the by the host – it makes for quite a centre-piece; both visually and of course aromatically too! All of the alfresco dishes are accompanied by dauphinoise potatoes or fries, mixed salad and a delicious spicy bean mix – served in a tomato sauce – that added a lovely Mediterranean edge to the experience. It’s that leisurely, relaxed more casual approach to dining that our European neighbours do so well and we’re latching on to more and more. With sharing platters to start filled with choices such as stuffed vine leaves, marinated sardines, tzatziki and olives with crusty bread and an ice-cream biased dessert menu we could easily lose an entire afternoon lazily eating and drinking in the summer sunshine. As the months roll by we’ll doubtless be finding the opportunity to reengage the sat nav and wind our way to Lower Ufford again – not least to for a second dish of those incredible beans! In aid of the Home Start Suffolk Coastal, your compères for the evening are Mr Alex Bringinshaw & Russell Stowe. Tickets are £20 per person which includes authentic paella cooked on a wood fire by Nina, Stephan & Hamish. Evening starts at 7 pm with food with bingo kicking off at 8pm. To book your tickets or provide a prize for this worthy course contact the pub. Local micro-brewery ales. Games on the paddock during the day. Live music in the evening with the Rhinos 7.45pm. Alfresco dining.